Today was the Nor Con (short for Norwich Convention). It’s a small, one-day affair held to raise money for charity. I stayed overnight with family in the local area so I can get over without too much travelling. It’s held at the Holiday Inn hotel on the outskirts of Norwich International Airport, reminding me in a way of Gallifrey One which is similarly occupies an airport hotel site. This is much smaller though. 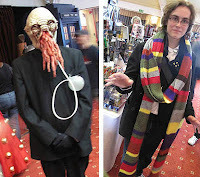 It’s a general science fiction convention, but as with a lot of these gatherings, there’s a strong bias towards Doctor Who, and not being a big mainstream event, it means there is as much emphasis on the classic series as new. 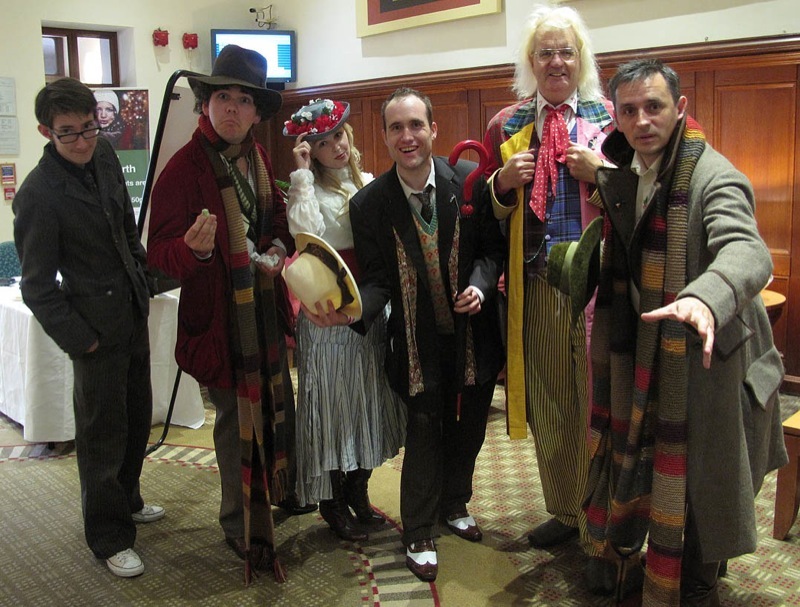 I knew a number of cosplayers attending, and there was a Tenth Doctor, Fourth Doctor, Romana, Seventh Doctor and Sixth Doctor (above). Later I saw a couple of Fifth Doctors, a Cyberman, another Seventh Doctor as well as a UNIT soldier. 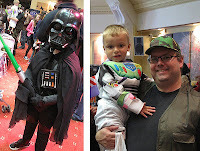 Cosplaying in the UK isn’t as popular as it is in the states, but there was a good contingent in attendance today, including a good range of sci-fi and comic book costumes. I found a Power Ranger; a cute female Stormtrooper; a chunky Iron Man; both Superman and Supergirl; and something I wasn’t really sure of its source. I also spotted a number of kids in costume too. The Buzz Lightyear was so cute! As typical with events there’s a dealers room, with retailers selling all manner of memorabilia and toys. Also in the dealers room were a number of displays. One had a computer controlled Robot from Lost In Space, which at the click of a mouse could speak all manner of comments. 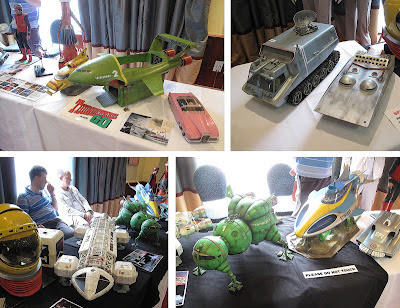 Next to him was a superb display of models from Gerry Anderson series such as Space: 1999, Terrahawks, Stingray, Thunderbirds, UFO, Captain Scarlet, plus the Starbug from Red Dwarf. On the other side of the hotel was a room set aside for the guest signings. 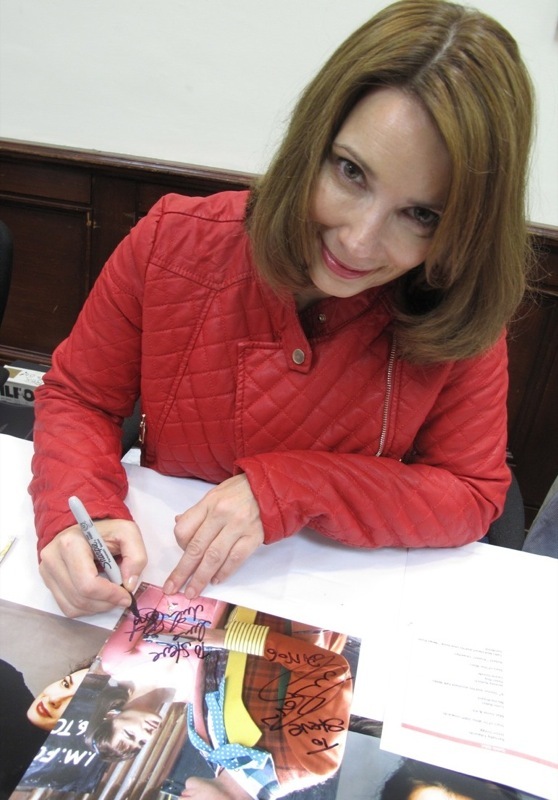 There were a number of Doctor Who guests, including Sixth Doctor Colin Baker and his then companion, Peri played by Nicola Bryant. They had photographs on hand for signing, so I got the both to sign a picture for me. 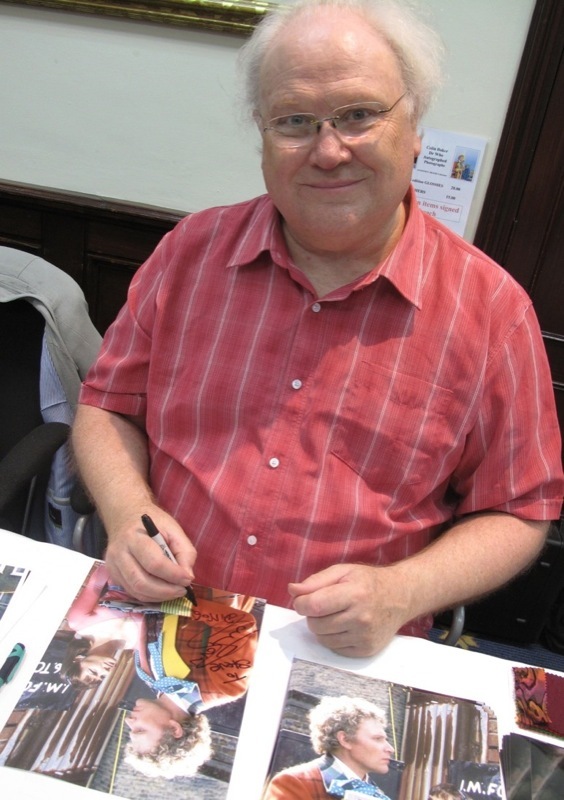 While chatting to Colin, I showed him some swatches I had for my Sixth Doctor coat. He was suitably impressed, especially with the lining I had woven. Nicola was sneaking a look, so I gave her a set too. 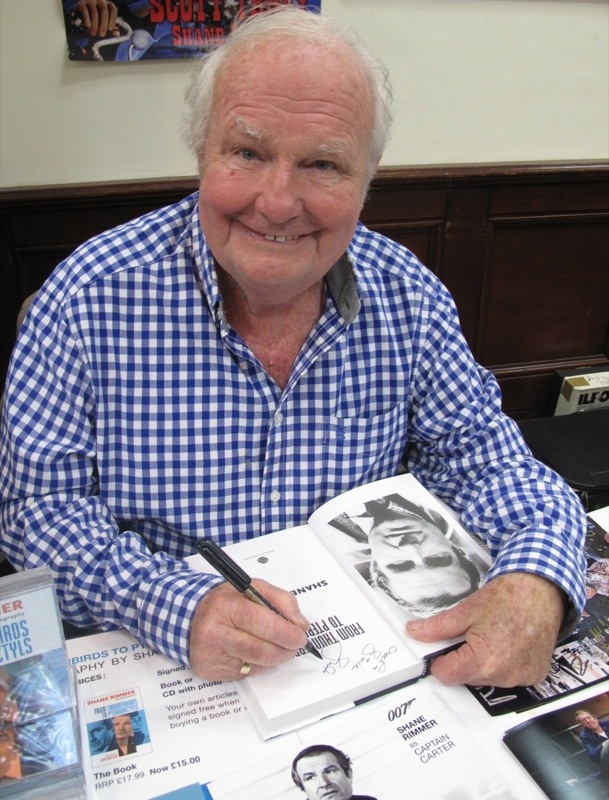 Elsewhere in the signing room was Shane Rimmer, famous for being the voice of Scott Tracy, pilot of Thunderbird One! Between the two rooms was an area where body painting was taking place. Two girls were having their entire bodies painted: one was as some form of fantasy character; the other as the Borg Queen from Star Trek. Throughout the morning I passed by to see progressively more of the painting being done. Later in the day well see them finished . . .
Back in the dealers room is a staged area from where the guests can be interviewed. I caught the end of 11am Barnaby Edwards, who is the lead operator nor the new series. He had lots of interesting stories to tell of being cooped up inside the fibreglass pepperpots for hours on end! Noon saw the next interview of that day, this time with special effects expert with Mat Irvine. It was an open forum with questions from the audience, ranging from how long it took to build the original K-9 (2 weeks); to an extended discussion about Robot Wars, for which he acted as consultant and judge. 1.30pm was then An Audience With The Daleks. This involved all five of the Daleks attending answering questions from the audience in character. 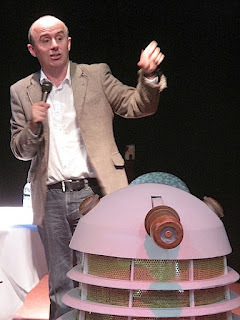 It was quite fun, with questions ranging from a discussion as to why they have sink plungers (for cleaning toilets, obviously); to why we never see baby Daleks (baby balls of hate sit in Mark III travel machines with booster seats); to if Daleks have birthdays (some don’t, and are very bitter). 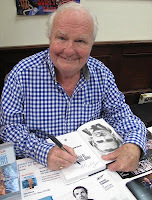 After lunch it was an open question and answer session with Colin Baker and Nicola Bryant. 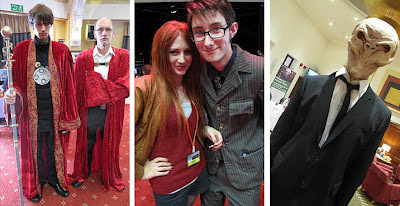 Since the questions were all from the audience, it was a mixed bag from asking what past enemy they would have as a companion (Nicola - Sil, Colin - Davros); to who was their favourite actor playing The Doctor (Colin said Troughton first, as he took the mantel first, but since Matt took over, he was now his favourite). After the question and answer session finished I went back out to the reception area to find the body painting had been finished. 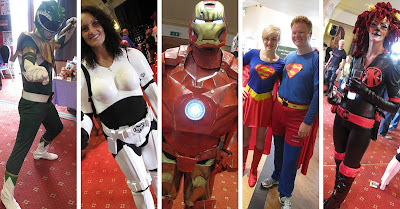 They looked awesome and were posing for photographs for a charity contribution. I’m still not quite sure what the inspiration for the stripy lady was, but she looked the part. What you probably can’t quite see is the edges of the stripes have a thin line of glitter. Very detailed work. The final question and answer session was with Robert Llewelyn, who plays Kryton in Red Dwarf. He was very entertaining and kept the banter going with the audience. He has not long finished filming a new series of Red Dwarf due to be screened on Dave soon, but couldn’t say too much about it, so couldn’t answer all the questions he was being asked. Nor Con was a relatively short, one-day convention, but it was quite a fun to attend and the guests were very entertaining. While I was saying goodbye to friends, Barnaby Edwards was in the reception waiting for his taxi. He’s a great sport and always has time for fans, so posed with us for a photo or two. Here’s my favourite. As I mentioned right at the beginning of this review, the convention aims to donate money for charity. 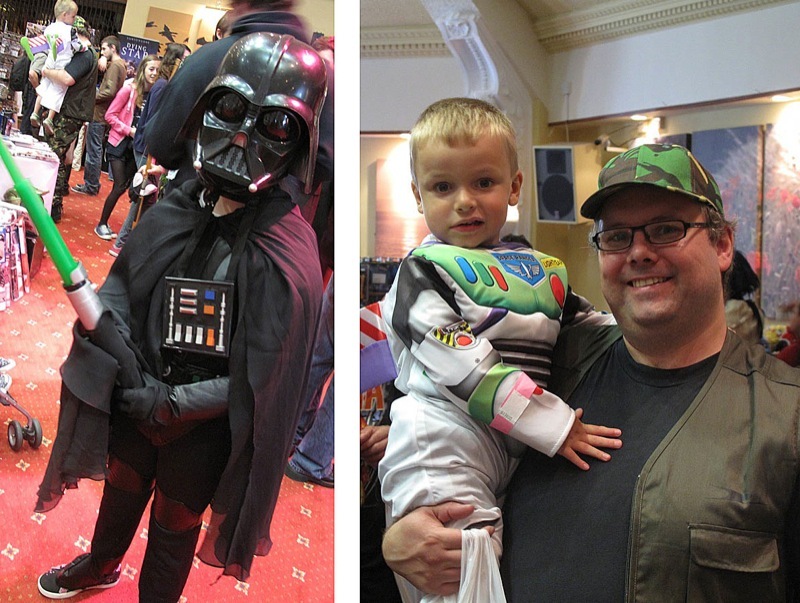 This year they raised an amazing £6,000 to be split between a number of good causes. Whoa! 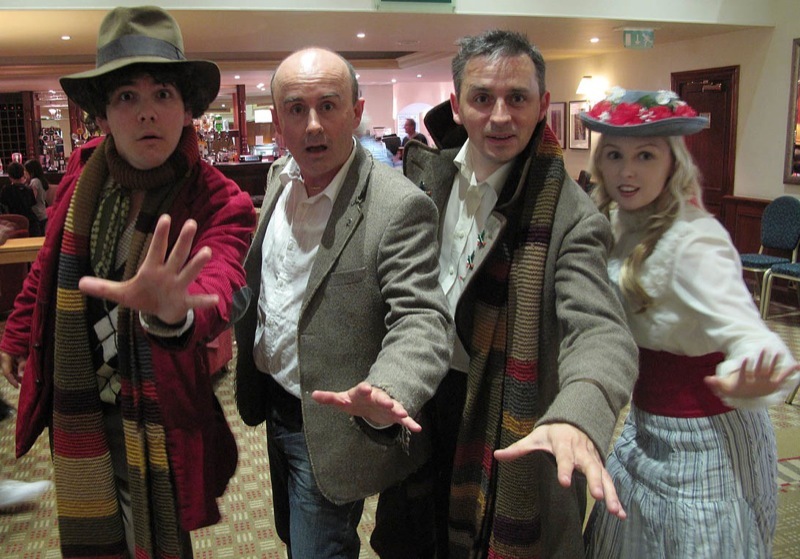 Where'd you get your fourth Doctor coat? Did you make it from your pattern and didn't blog about it? It looks really good except that it might be very slightly too long, but I can't tell because of the poses you're in. Yes, it's the coat I have been working towards for a while now. I've been so busy I didn't get around to blogging about it, but plan to soon, along with some proper photos to show off the whole costume. The S17 jacket looks fantastic - Please give us more info!! Where did you source the badges?? I also recognise the scarf - was it from a guy in the US who sells occasionally on ebay..?